Time surely flies! With the Year of Dog coming to an end, I’m looking forward to welcome the Year of Pig. Though the pig is the twelfth of all zodiac animals, they are actually the symbol of wealth. It is said that Pigs have a beautiful personality and are blessed with good fortune in life. 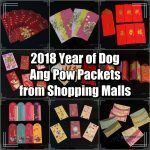 Last year I did a post on 2018 Year of Dog Red Packets and the response was very good. 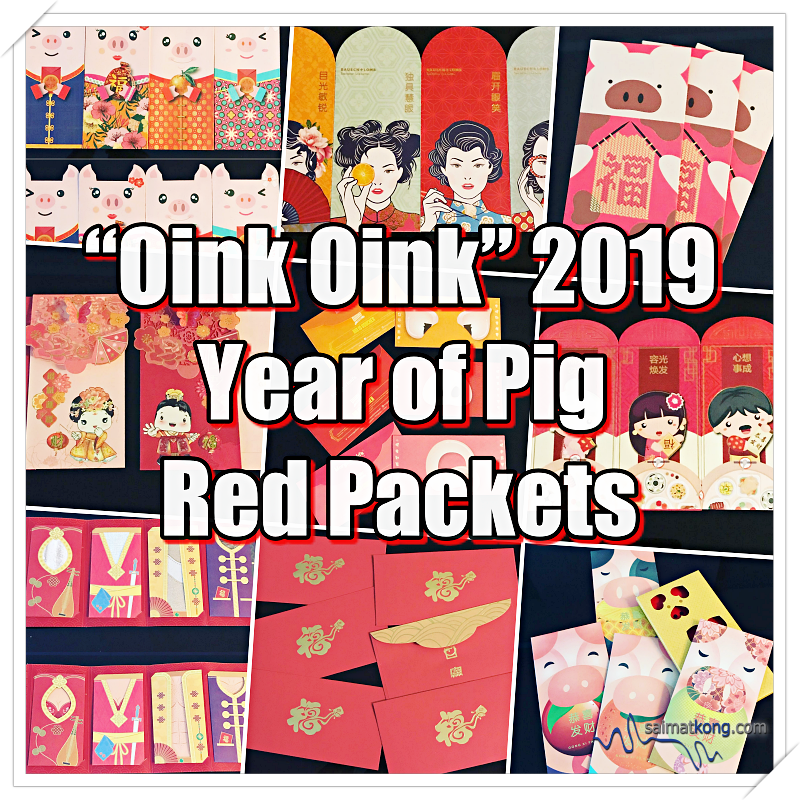 This year, I’ll again be featuring various Chinese New Year red packets from different brands and companies to welcome Year of the Pig. 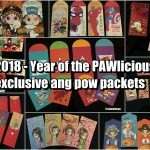 If you’re a red packets (Ang Pow) collector, this post will be a good reference for you to know where to hunt for these exclusive and limited edition red packets. 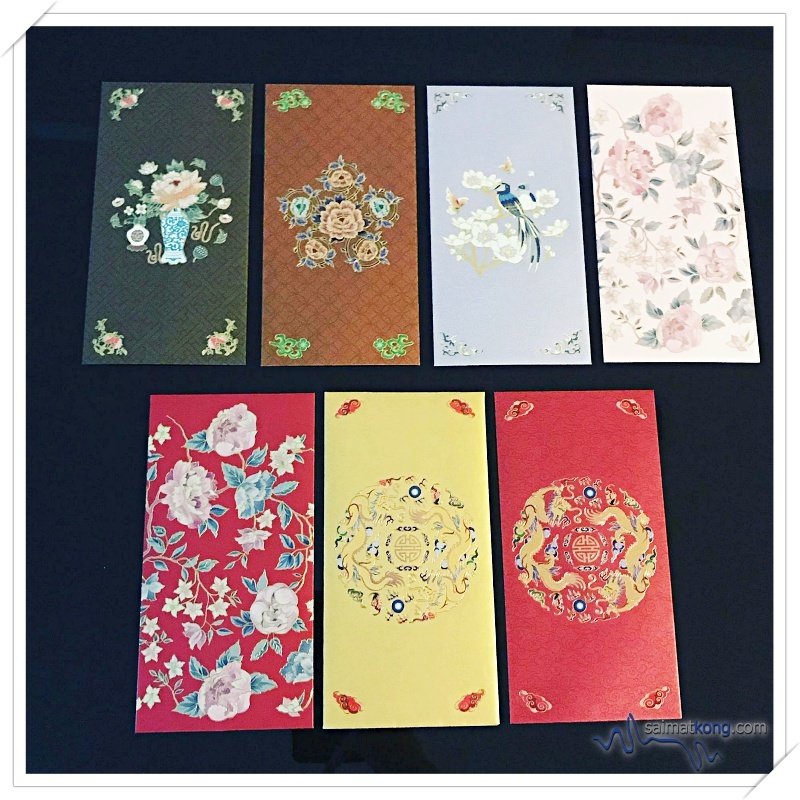 These red packets come in various designs and themes, some are cute, some are classy, some are unique, some are creative with one in thing common; all of these red packets are exclusive and limited!!! If you’re a brand or company that wants your red packets to be featured in my blog post, do send me an email, I would be honored to have them featured in my blog. 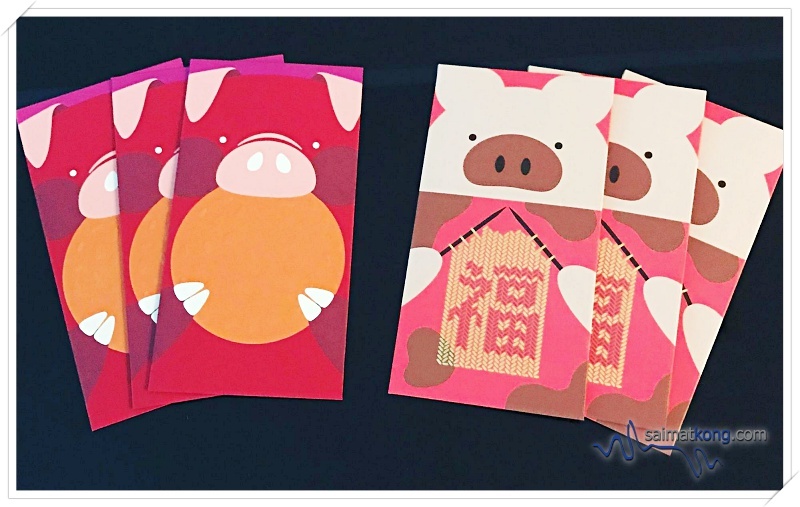 Antalis Malaysia, a leading paper manufacturer came out with a fun red packet featuring two designs of piggy to usher into the Year of the Pig. Apostrophe, one of Malaysia’s leading marketing and communications agencies never fails to impress me with their red packets design. 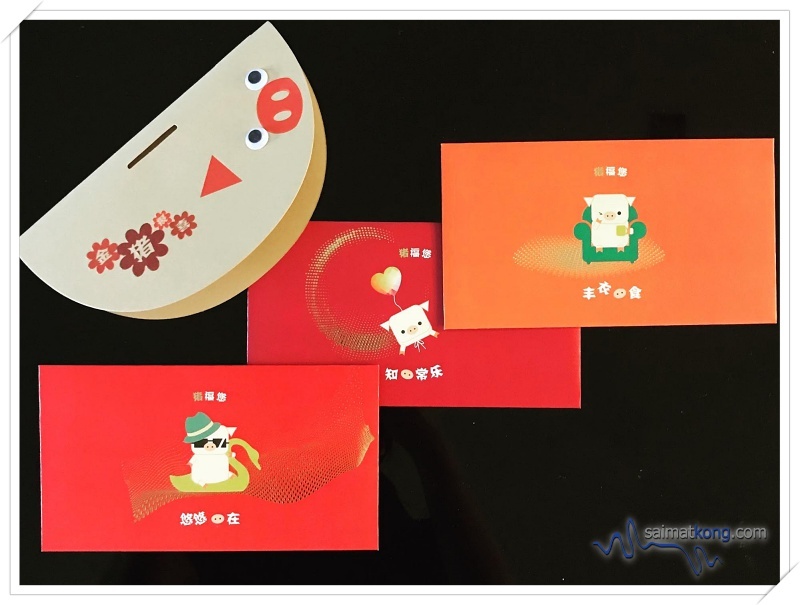 This year, their red packets design features cute and adorable pigs. If you look closely, it actually looks like a ‘Piggy Bank’, shaped like a pig. 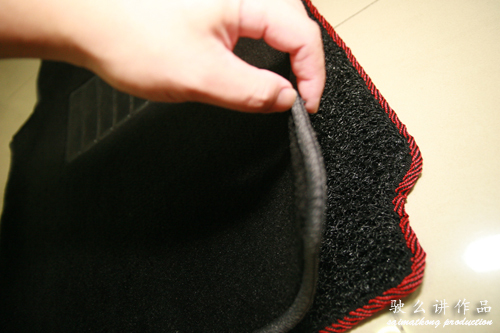 Bump up the cute factor by folding the flap to reveal its cute piggy tail. So creative! And do you know that pigs are associated with luck and good fortune? Receiving these red packets is like receiving good luck and fortune! Asia Food & Beverage Sdn. 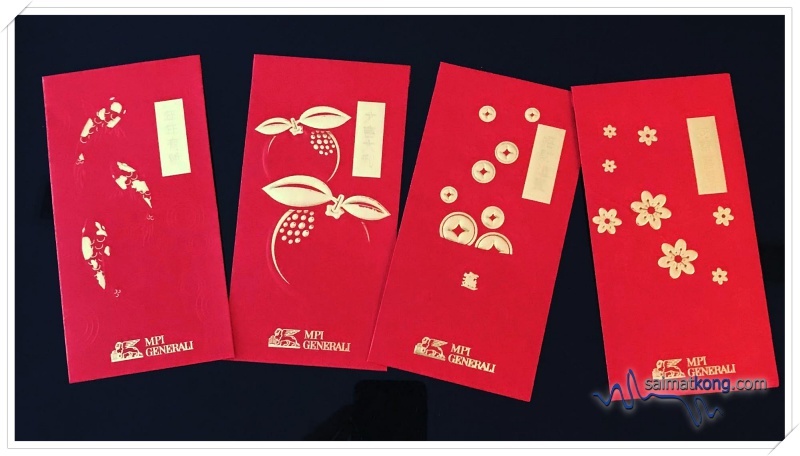 Bhd., a manufacturer of herbs, spices, white coffee & milk tea came out with a set of exclusive red packets in three designs printed with auspicious new year greetings on each piece. 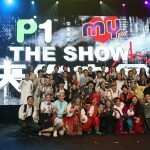 Under the group are brands including SunSoya, Uncle Sun, Old Village White Coffee and Arifpapamama. Bausch + Lomb Malaysia set of red packets come in four designs and four different colours with different auspicious new year greetings printed on each of them. 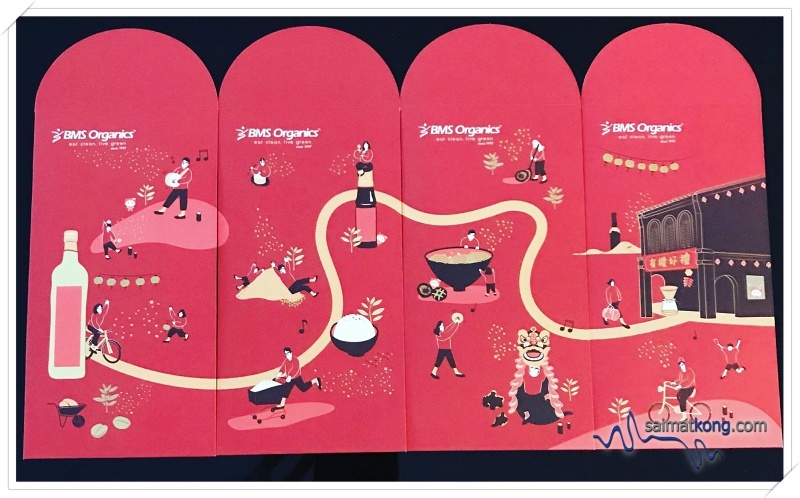 BMS Organics printed a set of 4 piece design red packets in bright shade of red to celebrate Chinese New Year. The red packets when combined together shows a route back home to celebrate the lunar new year. 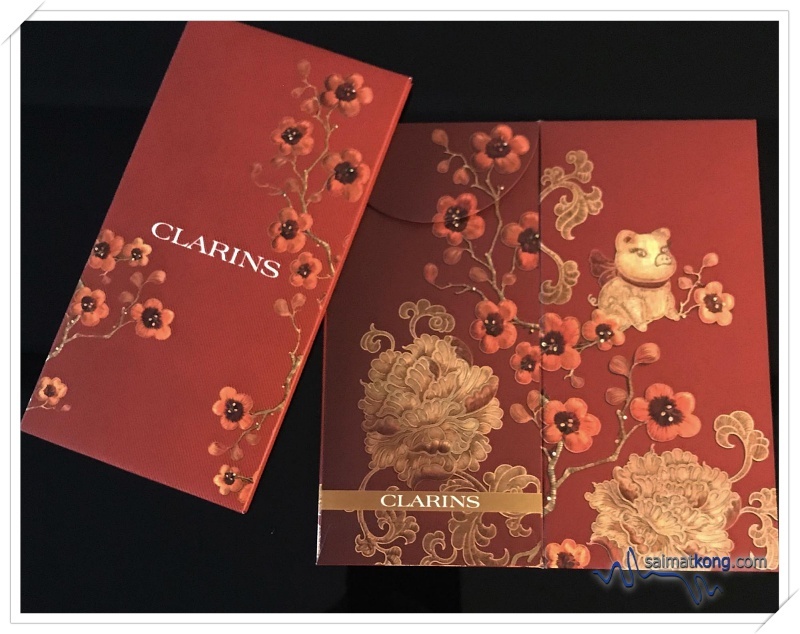 Clarins printed a single piece design for its red packets this year featuring flower designs in red “Ong” cookout and not forgetting that a cute piggy is featured on the red packet. Anything with piggy is cute!! 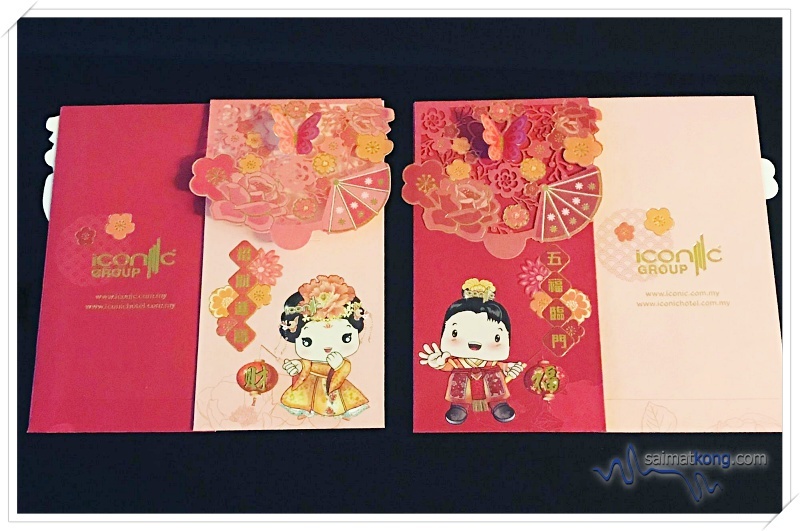 Delica’s red packets for 2019 feature lion dance with Chinese New Year wishes. Get these limited edition red packets when you purchase Delica Rich & Less Sugar Ipoh White Coffee. 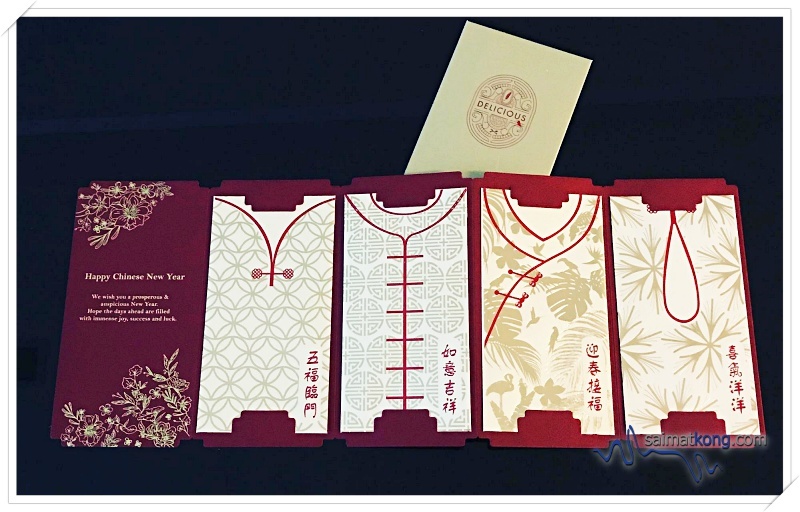 Delicious Group is offering these classy red packets featuring exquisite traditional wear with a minimum spend of RM100. 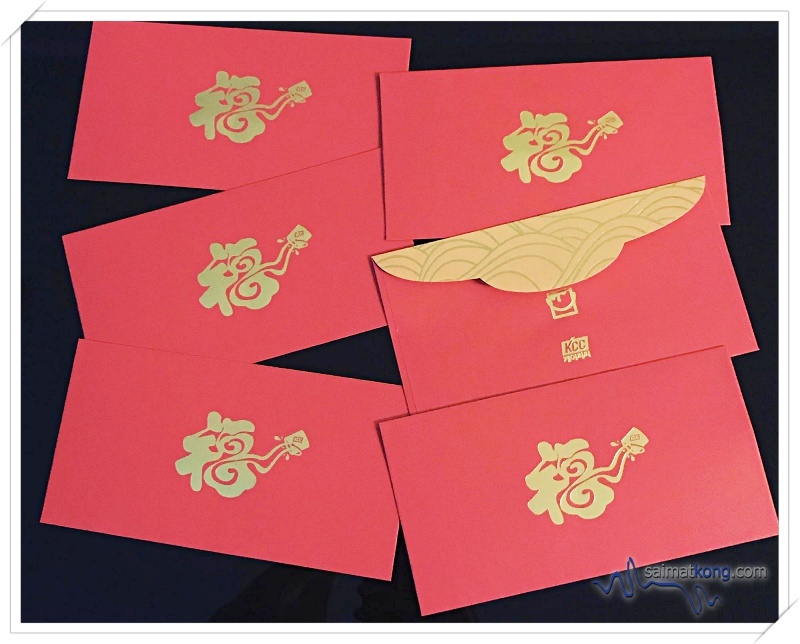 These elegant red packets come with a folder and each piece is printed with different auspicious Chinese New Year well wishes. It’s definitely a must-have in your red packets collection. 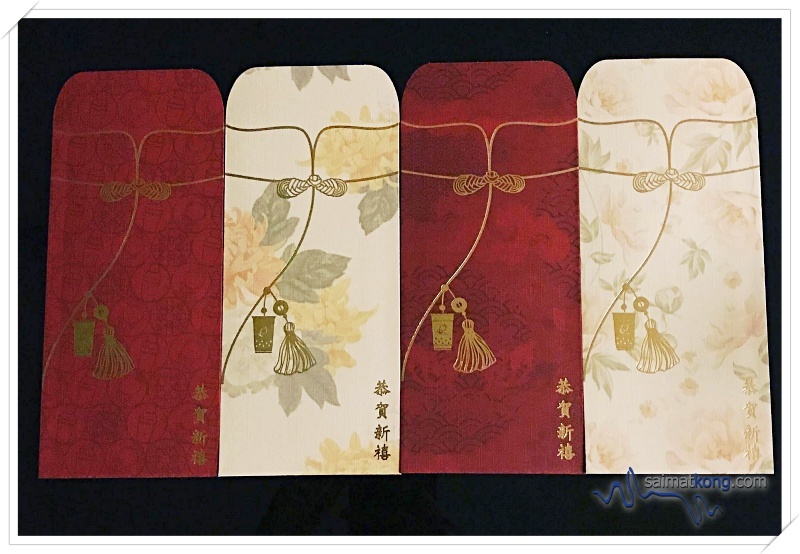 The limited edition red packets from ECOLITE comes in six designs. These ang pow packets are printed in bright shades of red with different auspicious new year wishes printed on each of the red packets. 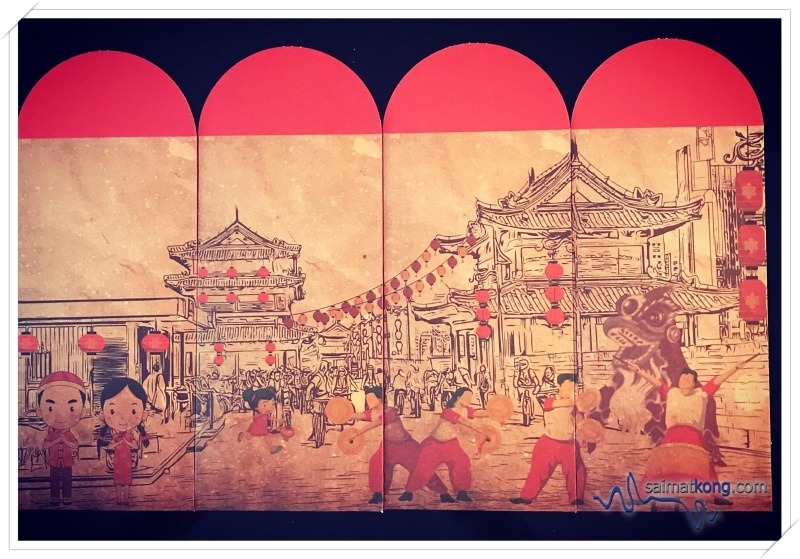 For Chinese New Year this year, Evolve Concept Mall printed an exclusive 4 pieces set of red packets featuring a lively scene of Lunar New Year with lion dance & drum performance. 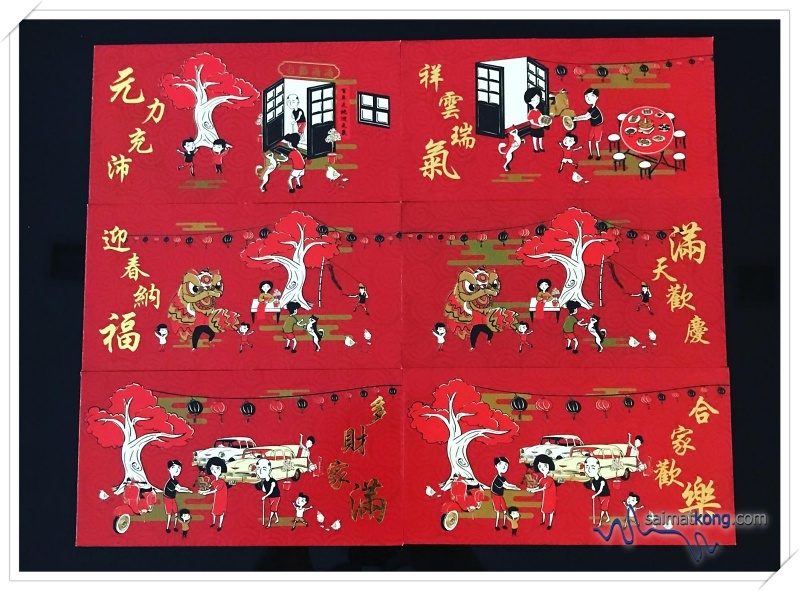 Follow Me printed a set of family themed limited edition red packets for its customers. 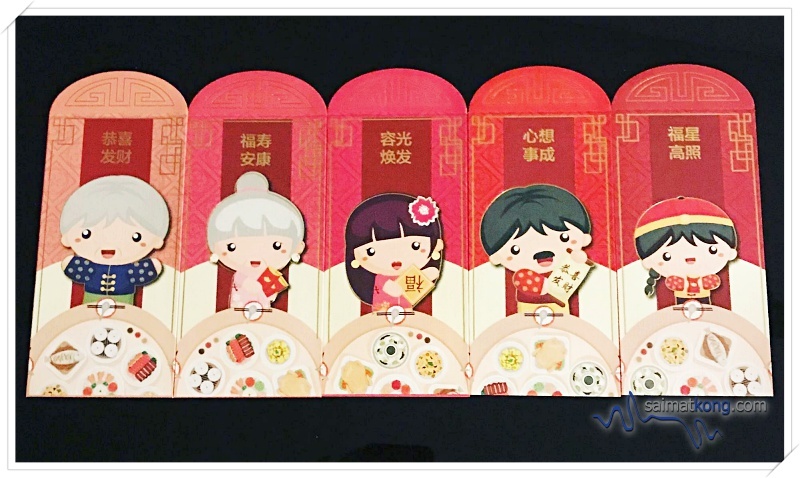 The 5 piece set of red packets feature grandpa, granny, daddy, mummy and a little boy all dressed in traditional outfits. Each piece of the red packets is printed with Chinese New Year wishes in gold. 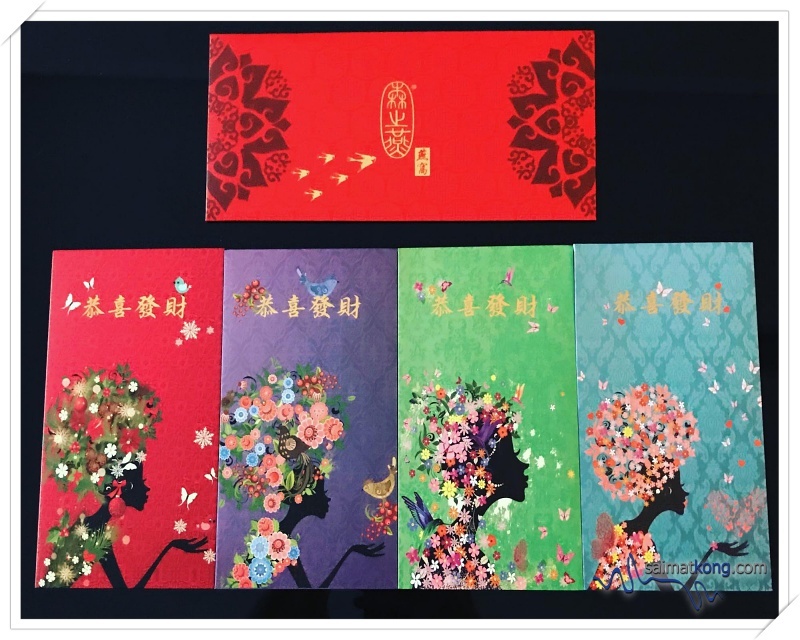 This year Forest Birdnest House or 森之燕 printed a set of maiden themed red packets in a set of four colours. 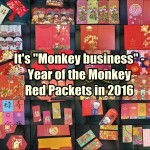 Each of the red packet is printed with “Kung Hei Fat Choy” greeting. This is a beautiful set to add to your existing ang pow packets collection. 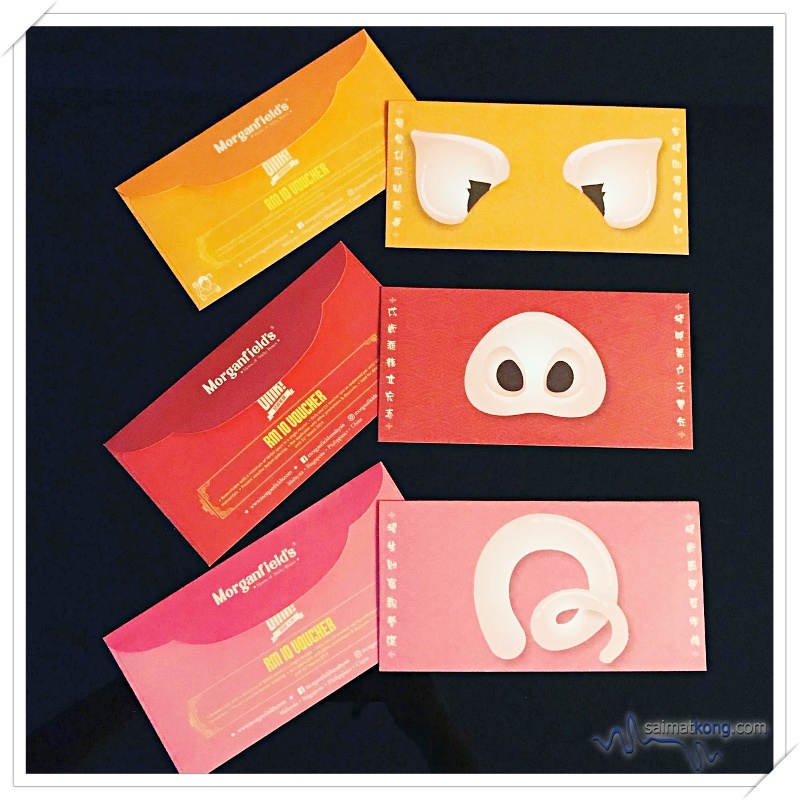 HHBespoke, a creative brand under Beluga Ltd. and a creative start-up based in HK printed a set of classy red packets. 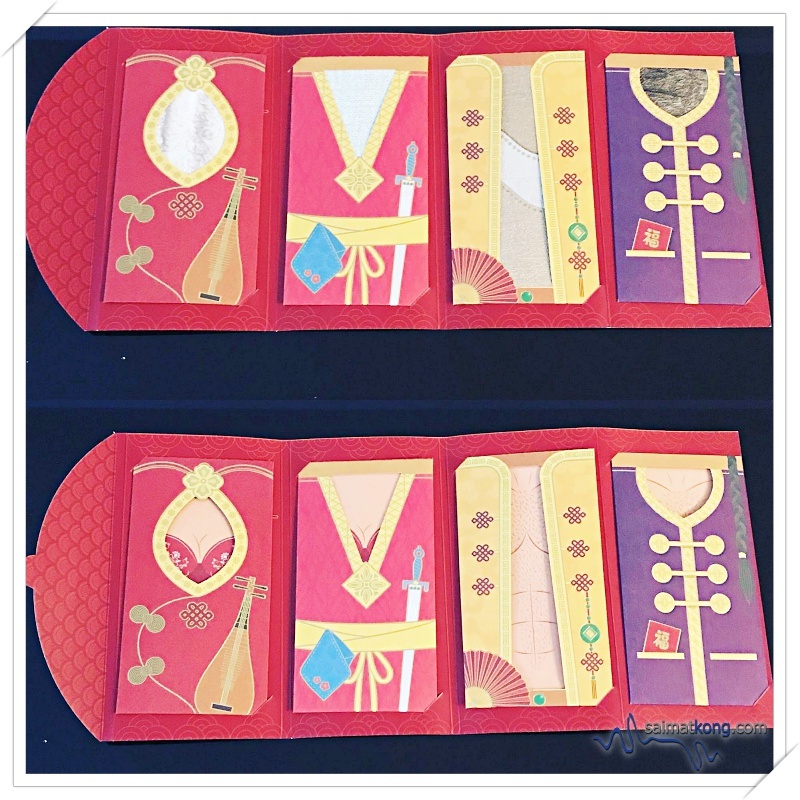 The exquisite and sophisticated design of these red packets are inspired by the famous TV Drama series : Story of Yanxi Palace. Printed using traditional colors and design, gold foil printing and UV inks are employed to produce these classy red packets. 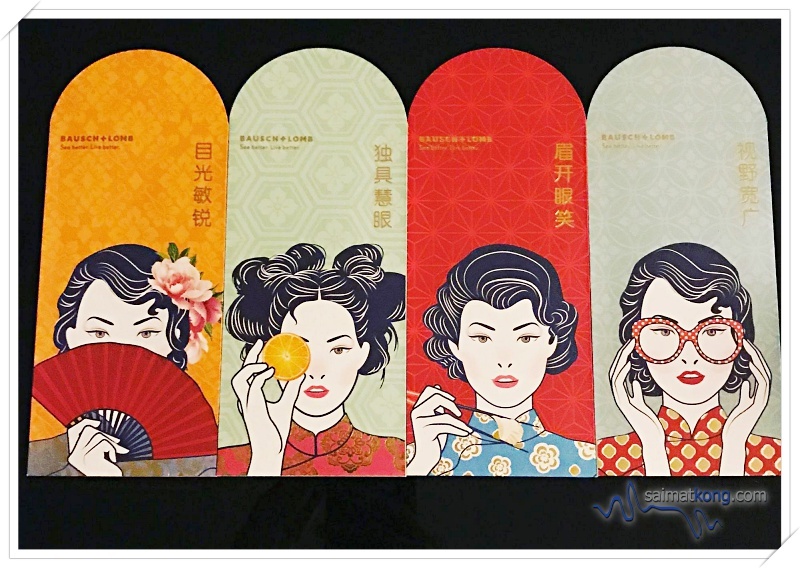 Iconic Development’s red packets are so beautiful with die-cut design, making it so memorable and stand out. 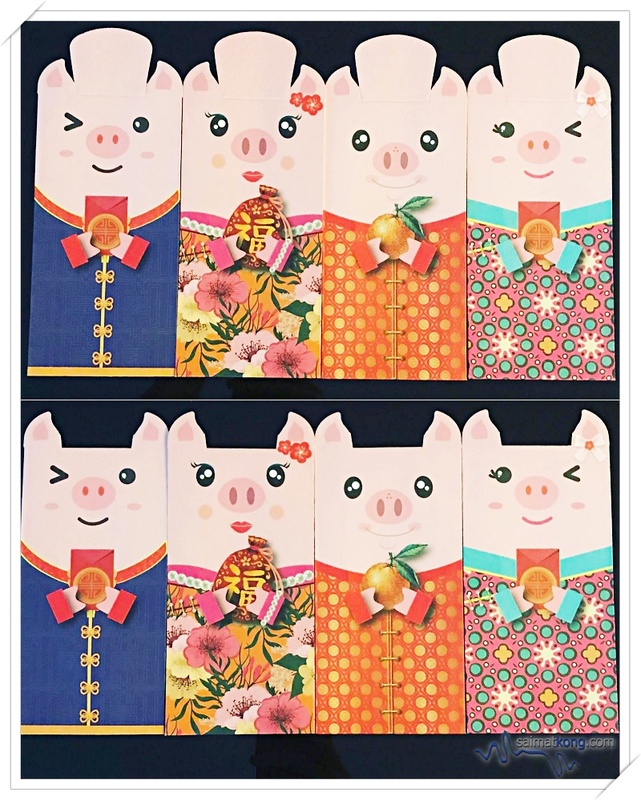 Kampachi Restaurants is giving its diners a set of red packets featuring a set of 4 “oink oink” cute and adorable piggies. Each piggy has the Chinese New Year wishes “恭喜发财” Gong Xi Fa Cai printed on the red packet. KCC Paint is keeping it simple and opt for traditional theme by printing a single piece of red packet in bright red with the Chinese word “福” to wish everyone a Healthy, Happy & Prosperous New Year! 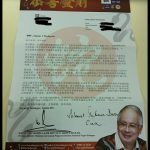 To celebrate the Lunar New Year, Koi The Malaysia printed an elegant set of red packets featuring traditional wear designs for its customers who spend RM28 and above in a single receipt. 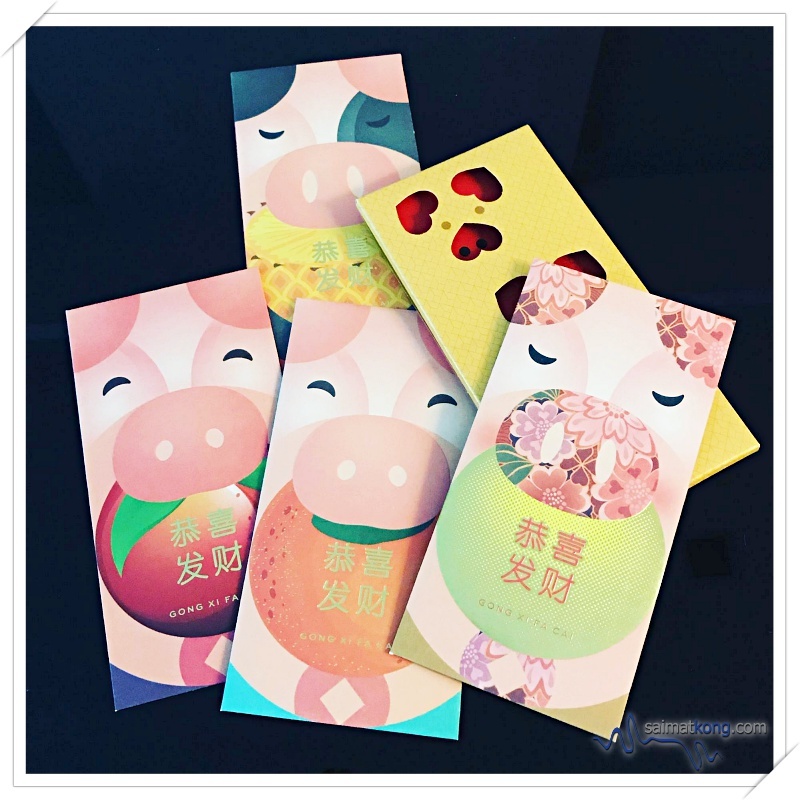 To usher into the Year of the Pig, Puzzle Planet printed a vibrant and cute set of exclusive red packets. 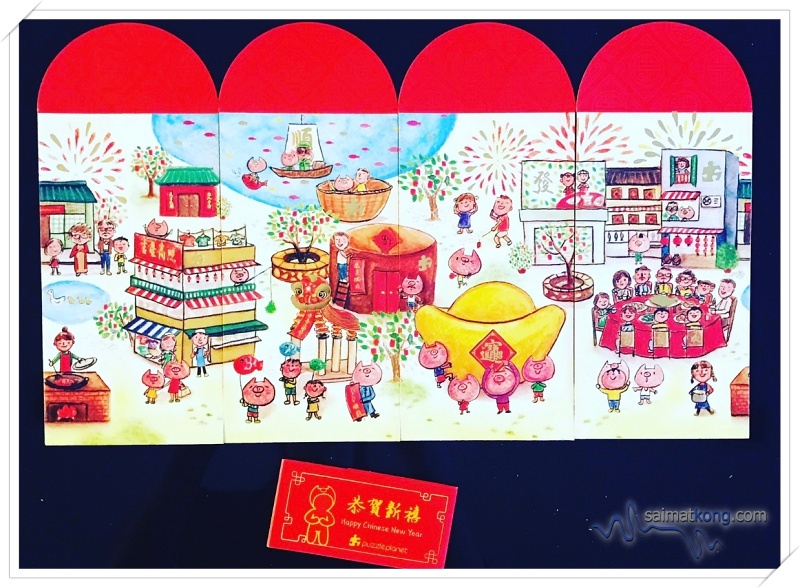 The red packets form a very beautiful picture of Chinese New Year featuring cute lil’ piggies celebrating lunar new year. It’s definitely a must-have set to be added in your red packets collection. 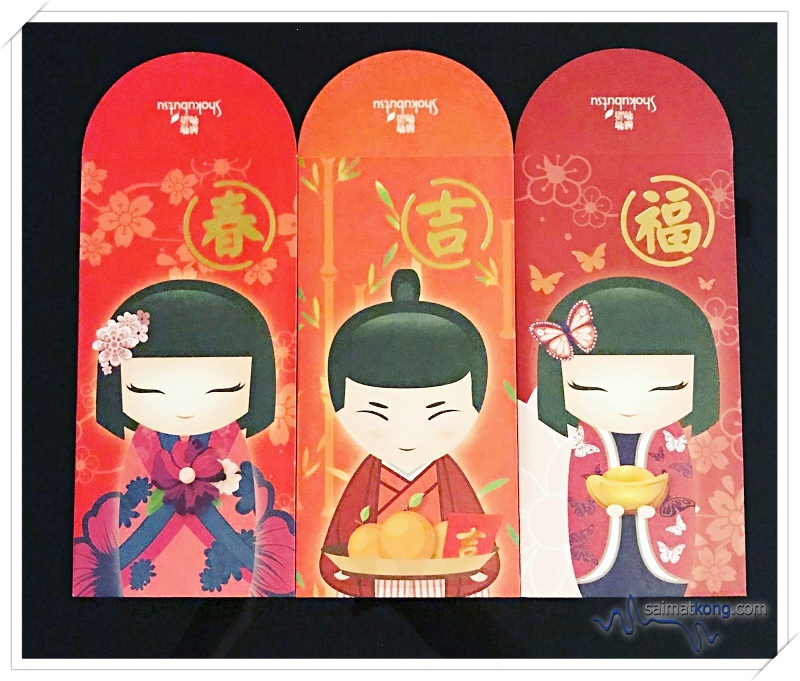 Shokubutsu; a brand famous for its Japan formulated body wash, printed a lovely set of red packets in three designs featuring two girls and a boy in traditional clothes holding flower, a tray of mandarin oranges and a gold ingot. The red packets are printed in vibrant colours and each packet has an auspicious Chinese word printed on it. You can get these lovely and cute Shokubutsu red packets when you purchase their products at selected hypermarkets. Sothys incorporated puzzle element into their red packets design this year. 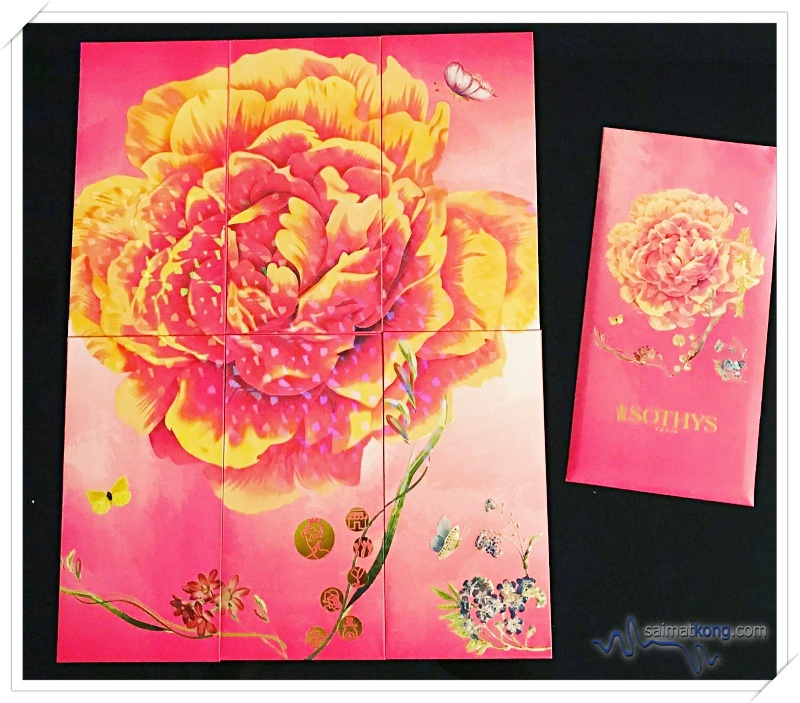 Fit all the 6 individual pieces together to form a grand peony flower that blooms beautifully. Each piece symbolizes the brand promises of Sothys to their customers. 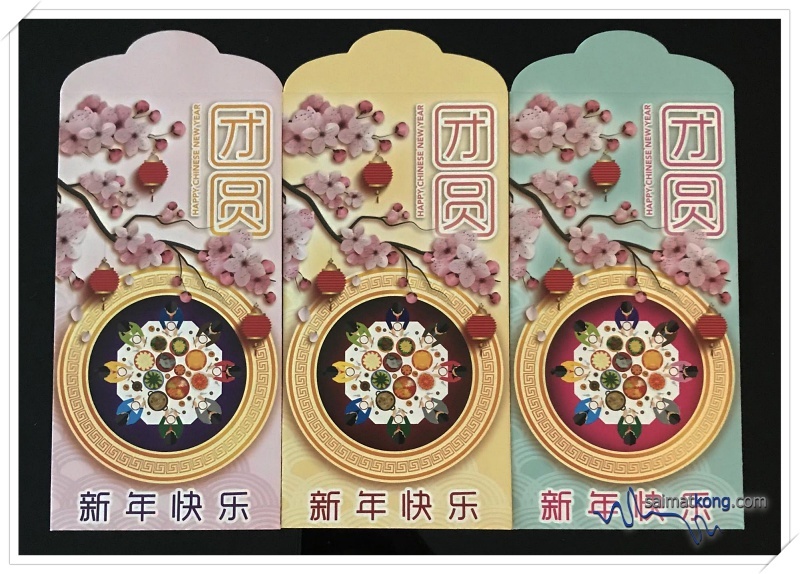 To celebrate Chinese New Year this year, Taiping Sentral Mall printed a set of reunion themed red packets in three lovely pastel colours. 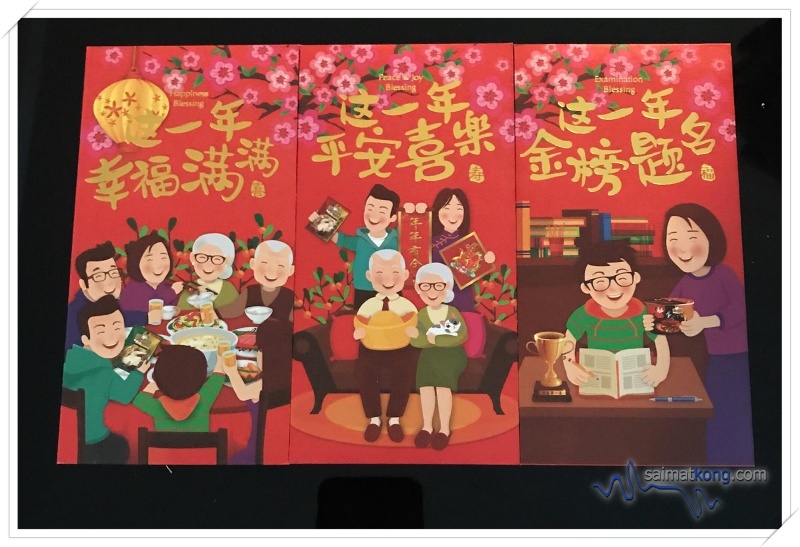 Each of the red packet feature family having reunion dinner together which truly represent what Chinese New Year is all about; family reunion with loved ones. The theme for Thinkingifts’ limited edition red packets is ‘Reunion’. There are 6 colorful red packets featuring 6 various dishes that we usually have for reunion dinner such as Yee Sang, Chicken, Fish, Peanut & Lotus Root Soup, Vegetables and Prawn. This set of ang pow also comes with a pair of chopsticks that you can for your reunion dinner with family. 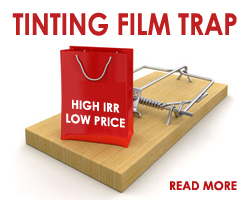 How innovative! 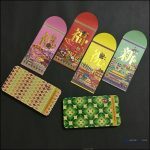 Michelin printed a specially designed set of red packets featuring Chinese New Year elements such as koi, mandarin oranges and flowers. It’s quite an unique set to add to your red packets collection. 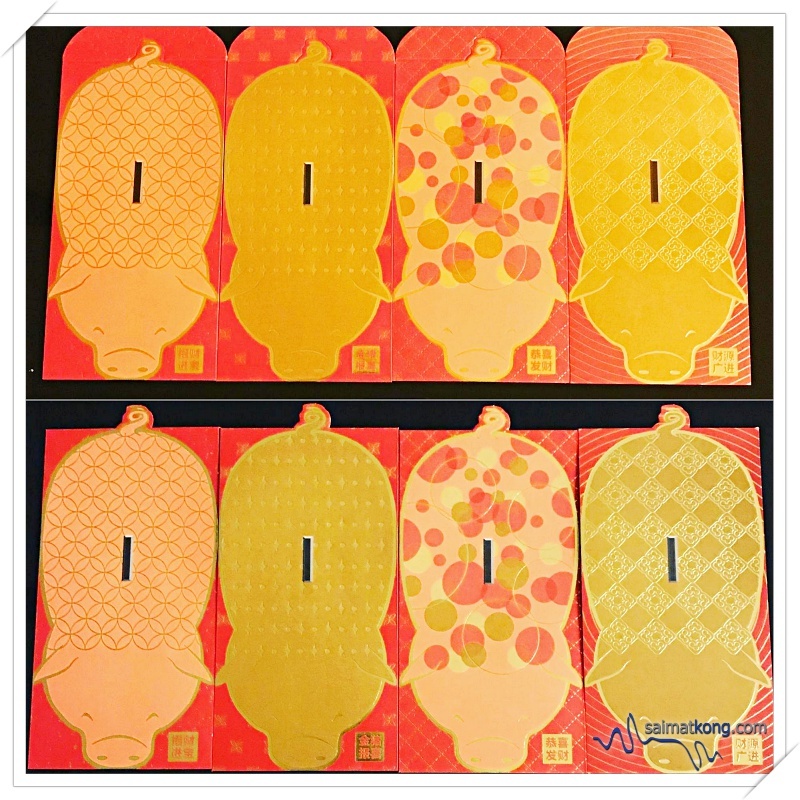 Midas Touch, one of the leading local professional commercial and photography studios in Malaysia printed a set of vibrant and cute red packets featuring the zodiac for 2019, a cute piggy in the middle with auspicious new year greetings on each of the ang pow. To celebrate the Year of the Pig, Morganfield’s came out with red packets in 3 different designs featuring the piggy ear, nose and it’s tail. Each of the packets are printed in bright colours while the back of each red packet has a RM10 voucher that you can use for your next piggylicious meal at Morganfield’s. 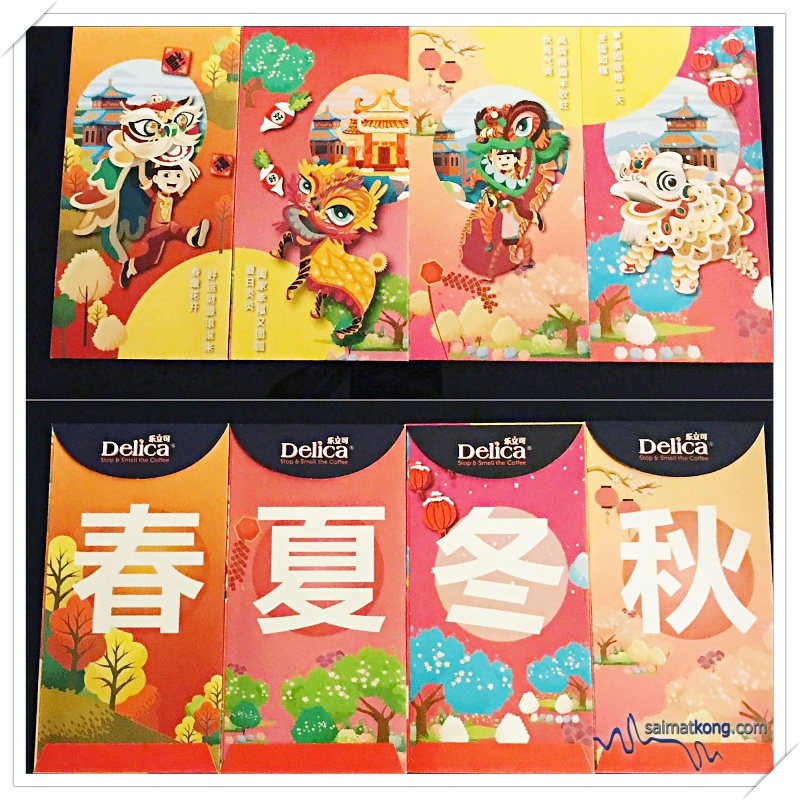 To celebrate the Year of the Pig, MPI Generali Insurans printed a set of red packets in four designs featuring fishes, mandarin oranges, gold coins and flowers which is the symbol of abundance, prosperity, good fortune and wealth. If you’re a fan of “red”, you’re gonna love this set of red packets coz it’s printed in bright shade of red, the ‘ong’ colour during Chinese New Year. The Brew House has specially designed a set of family pig red packets featuring daddy pig, mummy pig and two adorable piggies. This totally reminds of the cartoon that my kids watch : Peppa Pig! Fold the flap to reveal the piggy ears. 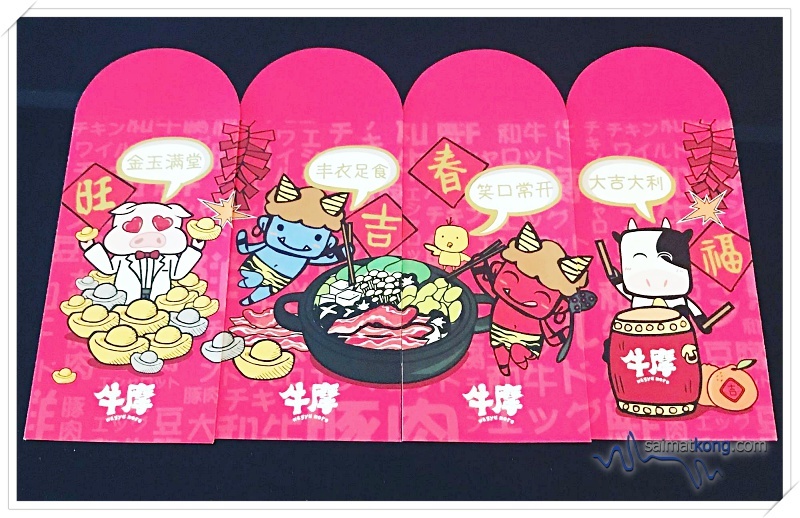 This set of red packets is just way too cute and I’m sure kids will be so happy to receive this cute red packets. Dine at Wagyu More to redeem these cute exclusive set of red packets from Wagyu More featuring Red More, Blue More and their friends – the learned Professor Dr. Pig, the spotty, stocky Cow Cow and the petite Wakadori chicken Hiyoko. Red More & Blue More are seen stirring a pot of Wagyu More’s famous Japanese shabu shabu loaded with premium ingredients. 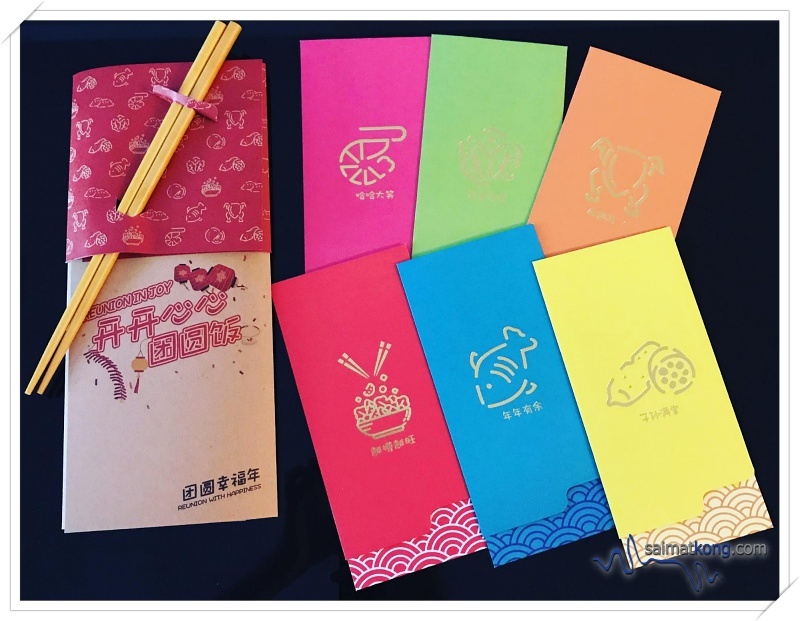 Each of the red packet are also printed with different Chinese New Year wishes. Hope you’ve enjoyed my red packets post. 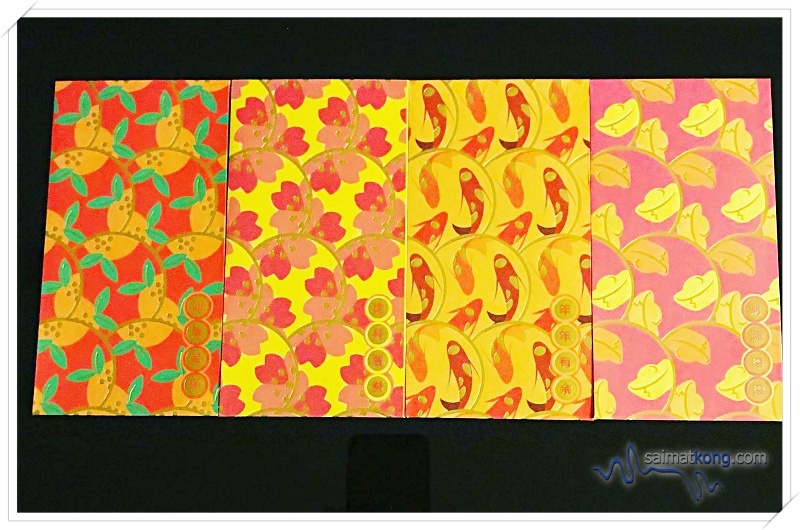 I’ll be updating this post with new red packets designs when I get them, so do come back to view the new red packets. Lastly, wishing all my beautiful & awesome readers a Happy, Blessed & Prosperous Year of the Pig! May we all be blessed with abundance good fortune, good health & prosperity in the year ahead. Huat ar!